Following a lengthy close-up of a young woman (Greta Gerwig) driving to accompany the opening credits, we believe this will be the character we follow through this tale. She is later revealed to be Florence Marr, Phillip’s PA. While Stiller occupies the titular role, it is Florence who has an equal share of the story. Roger and Florence meet awkwardly and her stop by the house results in Roger sending her to buy him ice cream sandwiches and whiskey. Florence is a flighty, kind-hearted and well-meaning young woman, but she’s meek. Immediately after turning down a check from her employer she asks her friend to swing her a much-needed forty bucks. She has just got out of a long relationship and seems to have lost her footing with the world. She sings at small bars and regularly sleeps with random men. As unlikable as Roger is, he is a fascinating individual to observe. To use a phrase from Curb Your Enthusiasm, Roger is a ‘social assassin’. He seems to be stuck in his own high-and-mighty world of disapproval; he doesn’t show respect towards anybody and always seems to say the wrong thing and make things awkward. This is a performance from Stiller unlike any I have yet seen. Following a string of terrific roles – Zoolander, There’s Something About Mary and Meet the Parents – his recent shtick of playing the moody, uptight everyman (Tower Heist, The Watch) is wearing thin. It might have been courtesy of this film that he has taken on these more serious comedic roles, but here he adds another level of complexity altogether. He commands the screen with his peculiar tics. It is always shocking to be so closely associated with someone like Roger and yet you find yourself hoping he can turn himself around. 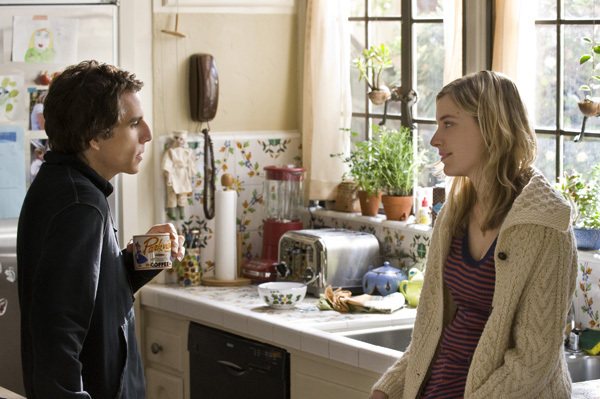 While Stiller and Gerwig shine, the support cast is a weird and wonderful bunch. Everyone is doing something unconventional. Ifans is terrific as Roger’s ex muso buddy – a man who given up being a guitarist to run a computer repairs business. He has overcome drug addiction and is now in the middle of a marriage crisis, which roger unsympathetically urges him to end. Apart from Florence he is the only person who appears to tolerate and sympathise with Roger. They unresolved conflicts threatening to surface and Roger’s ungrateful antics cause them to boil over in one of the most heartbreaking sequences. Chris Messina phones in his brief role as Roger’s short-tempered yuppie brother, but he gives it a hint of entitlement and malice as he talks down to his brother, a man he finds irresponsible. Mark Duplass makes an appearance; one I didn’t remember on first viewing. He has such terrific comic timing alongside Stiller. Juno Temple plays an Aussie, while Brie Larson and Dave Franco appear as two of the partiers who take over the house in the final act. Interestingly, the pair would be cast again together in recent comedy, 21 Jump Street. The great thing about Greenberg is the fact that the characters talk and converse how people actually talk. They ramble, say the wrong thing, and are erratic in tone and temperament. There are more than enough well-earned laughs that result in this disapproving behavior to be simultaneously comical. There is a scene I want to mention. It is one of Gerwig's many great moments. Florence is sharing a story – a story that clearly amuses her but one she is nervous about sharing – and Roger’s reaction to it is severely harsh. On one level he has a point – her story no way relates to what he was talking about beforehand and reveals that Florence has poor self esteem and is prone to embarrassing herself for no reason - but it also perfectly sums up Roger’s social interaction problems. I respected Baumbach’s ability to capture these instances of awkward human interaction and give them such a genuine and intimate feel. It doesn’t feel like you are watching actors converse through a script. This human drama will understandably prove to be grating for a lot of people, but I found it to easily overcome it dark, morbid themes with bursts of unorthodox comedy. Great review, Andy. I'm a big fan of Baumbach and Greenberg in particular. What's interesting is that I had no patience for the self-centered characters in Margot at the Wedding but really enjoyed Greenberg. There's a fine line between having the type of person that Greenberg is be interesting and not too much to handle. Gerwig is great as always too.